Your clothes are an investment. Don't you want to apply the safest, gentlest method for removing wrinkles? To determine which method of removing wrinkles is the better option for fabric care, steaming and ironing were put to the test. Two identical 14.5 cm x 14.5 cm squares of black wool were purchased from a local fabric store. We steamed sample "A" for 1 minute with a Model J-2000 Jiffy Steamer. Sample "B" was ironed for 1 minute, on the proper heat setting, with a top-of-the-line residential iron. We then bagged, labeled, and submitted both samples to MVA Scientific Consultants in Norcross, Georgia, U.S.A. for detailed magnification. 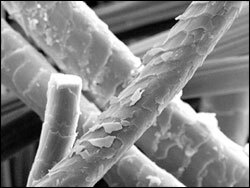 The Scanned Electron Microscope (SEM) images show any damage that may have occurred. 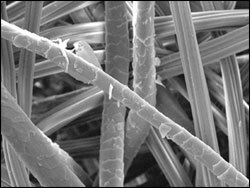 The fibres in sample "A" are in near perfect condition due to the gentle nature of steam. 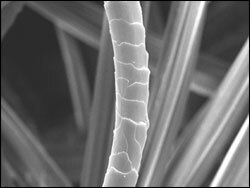 However, the fibres in sample "B" are clearly distorted. You can easily recognize the damaged fibres caused by just one application of the iron's hot sole plate. 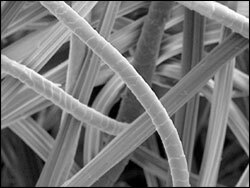 Unlike ironing, steam actually relaxes the fibres rather than crushing them. Now that you have a closer look into garment care, use what the professionals use a JIFFY STEAMER!